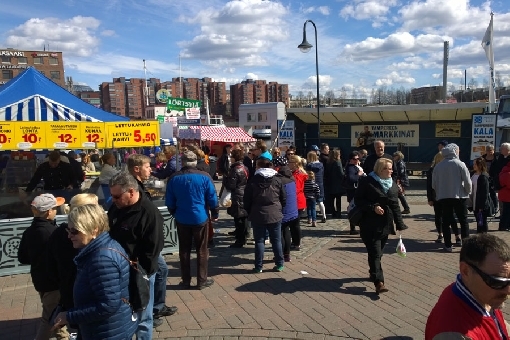 The multiple selection of delicious fish products and dishes are waiting for all friends of healthy and tasty food at Laukontori Square in Tampere 22.−24.4.2016. Tampere Fish Fair is celebrating at the same time both 25th Anniversary and 50th event. The Fish Fair was originally founded in 1991 and it has grown from small happening to one of the biggest events in the Tampere Region, organized by Fisheries Centre of the Tampere Region. Tampere Fish Fair was a revolutionary example for many other cities and areas of Finland. After big success of Tampere Fish Fair lot of other fish events were established in different parts of the country. From the very beginning, the basic idea of Tampere Fish Fair was to support fisheries industry and to promote the consumption of healthy fish products and fish – especially caught from lake areas. At the same time a great new event for whole family was born and people of the Tampere Region can enjoy the splendid atmosphere and wide range of delicacies by the Ratinansuvanto Pool twice a year.